Historical data is always required to analyze market behaviour especially at the time of the festive season. However, Diwali is the 5-day festival and for its upcoming, it is useful to make a generalization. Being a disciplined trader all of you must also know the before and after effect of Diwali from Market view. Investelite Research through its technical calculation describes you the pre and post effect of Diwali and also want to make aware about the high volatility of the market whether it will give more return or may suffer a trader with the huge loss. Let’s have a look at the t-paired test of this festival. The paired sample t-test shows that the mean for before Diwali effect on the stock market is .00 and mean for after Diwali effect on the stock market is -.0020. The significance value is .661 which is more than 0.05 as the level of significance is 5%. It means the null hypothesis is accepted and the alternative hypothesis is rejected which means that there is no before and after effect of Diwali on the stock market index of India. The pre and post effect of Diwali includes 8 days with the inclusion of Muhrat Trading and post include after Diwali effect on stock trading. One of the research-based reports also describes their test results that have concluded for a day of Diwali and one day after the day of Diwali comparatively more companies have shown increased abnormal return. However, the abnormal returns are not statistically significant. Some of the traders witnessed significantly higher returns in post-Diwali 7 days than 7 days before Diwali. According to the previous year of above-mentioned reports, the market has seen a downfall for the year 2008. According to historical data suggest that Nifty closed in red in the Diwali month in six out of last ten years. It plunged the most in the year 2008 when the Nifty saw a steep fall of nearly 30 %, followed by the year 2009 when it fell by 7%, and in the year 2010 Nifty saw a drop by of 2.5 %. The Nifty index gained the most in the year 2011 when it rose by 8 %, followed by the year 2012 when the index rallied a little over 5%, and then in 2014 when it saw a surge of 2.5%. Since the Modi government came to power, Nifty closed positive in the year 2014 and 2016 when it rose by 2.5% and 0.16% respectively. The Nifty slipped by 1.6 % in the year 2015. However, for the year 2017, the index has risen over 13% previous year of Diwali but midcap and small-cap stood out clear performances. Investelite Research suggests trading with a margin of 100-200 basis point as the markets are usually volatile and especially on Muhrat Trading hour. 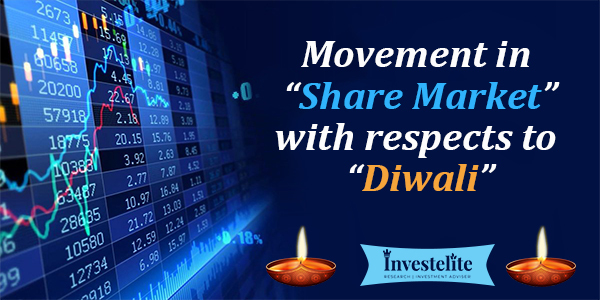 These above mentioned are the past records and analysis of the movement of the market with respect to Diwali. The volume of trade on the Muhrat session has been rising over the years. This time Diwali comes in the month of November on 7th. The month of the year effect reveals November has significantly higher returns. But Investors must take caution about the fact that not every share may observe the Diwali effect. We believe to have your Happy Trading with Happy Diwali!